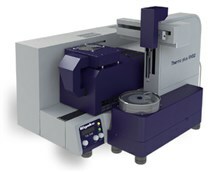 Thermodilatometry (TDL) is a thermal analysis technique in which a constant load is applied to a sample, and the amount of expansion and/or shrinkage of the sample is measured during heating. TDL8411 adopts Rigaku's established reputation on differential expansion principle where the thermal expansion or shrinkage generated from the detection mechanism itself can be cancelled. It offers high accuracy and excellent reproducibility in expansion and shrinkage measurements, even with low expansion materials and samples with low-thickness. Automatic length determination function is available where the sample length is automatically measured and can be registered. It facilitates the operation for the continuous measurement. We can set maximum 24 samples and aside from continuous measurements, it can also perform single measurement as well as interrupt-a-sequence measurement. There are no threads in Rigaku Thermo plus EVO2 Reviews at this time.